A seasonally decorated doorway on Commonwealth Avenue. 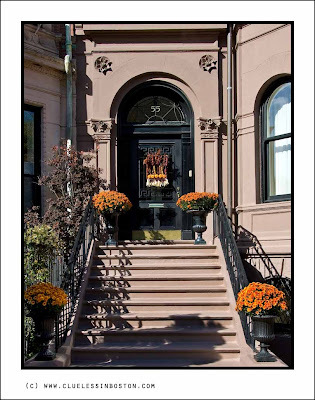 Commonwealth is indeed a grand avenue with stately old homes and apartments, and impressive front doors. How beautyful!The flowers give majesty to the scene! I'm always fascinated by the strange need people had to put simulated columns on their doorways, especially when the simulation only goes part way. That said, the colours make for a seasonal door. Such an elegant entrance made so inviting by the seasonal arrangements. Good capture. I love walking down Comm ave and peeking into the hidden gardens and admiring the care the builders of the past put into their buildings. the hanging flowers and those inside the jars, I like the jars - in short, I want this! Ah... unfortunately we don't have autumn decoration on or near doorways. I bet even around Christmas I'll have a hard time photographing a door with a wreath (except for my own. This one is lovely. I love doors and doorways of all kinds. I never can help taking photo of them. This one here is stunning! That looks really nice. An impressive greeting for visitors. Boston has so many fine old structures with great doorways - you'll have an easy time on the 1st with the theme of "doors."